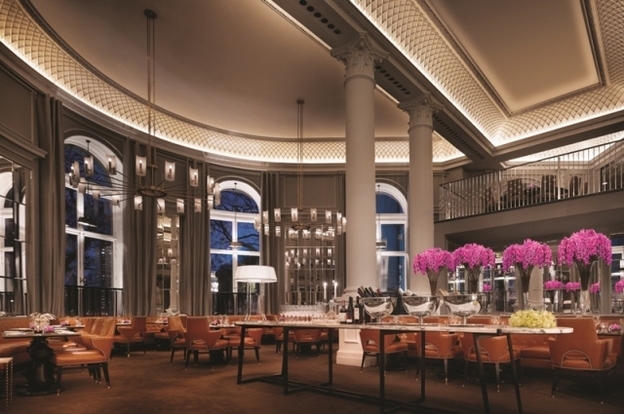 It’s not a long walk from The Corinthia London’s Bassoon Bar to the hotel’s Northall Restaurant, but it does offer an opportunity along the way to ogle at some pretty spectacular interior design on an epic scale. This historic Victorian building was once the domain of Whitehall mandarins when it was part of London’s Ministry of Defence; cue vast rooms, high ceilings and lashings of marble. 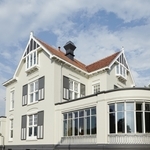 But that’s where all semblance of comparison ends as this is opulent luxury befitting a genuine five star hotel and about as far away from a civil servant as you can get. Northall is all about celebrating the best of British and thankfully it’s the food we’re celebrating rather than a British colour scheme; red white and blue would not be a particularly good look in here. It has a very grand look about it. Lots of airy space of course, the odd Corinthian column and plenty of plush tangerine seating. New Head Chef Ewan Simpson has not had time to put much of his personal stamp on the menu yet, but it was good to see him out of the kitchen and getting amongst his diners for a chat during lulls in service. Northall’s summer menu is on the table tonight. Plenty of choices to ponder, including a brain food menu specifically designed by the hotel’s neuroscientist in residence. I’m naturally curious as to whether this particular neuroscientist just happens to live here or is simply on call for any guest requiring an in-house neuroscience service. Thoughts of how much alfafa, mung bean, avocado, spring onion and cucumber is needed to feed my brain effectively bounce around my head, so I decide to focus on other less brainy starters. Perhaps cured beef, hummus and baby summer vegetables, lemon and olive oil dressing (£14) or beetroot-cured sea trout, soft herb dressing and Keta caviar with beetroot salad (£14). In the end, I plumb for a deliciously fresh Loch Fyne smoked salmon and cream cheese terrine with caper berries (£14) while Mrs. M chooses sesame seared tuna with horseradish crème fraîche and a soy and honey dressing (£14). 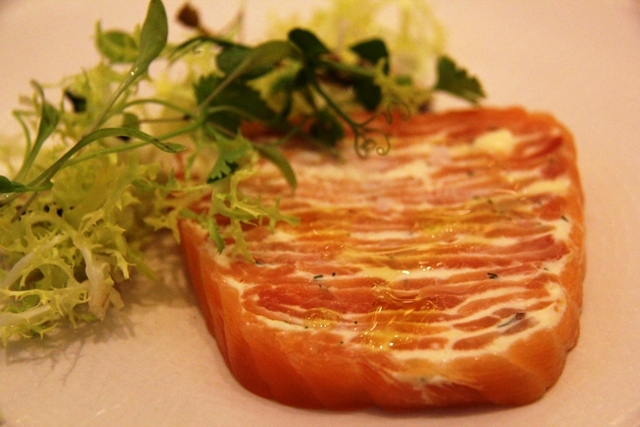 The terrine doesn’t look particularly spectacular on the plate, but it more than makes up for it in taste; the cream cheese and salmon combining perfectly in equal amounts. 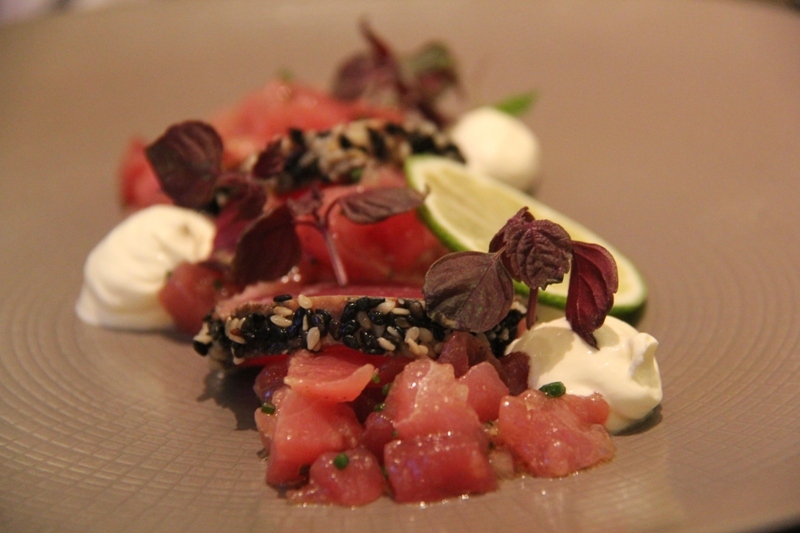 As a counter balance, the tuna dish looks spectacular on the plate and tastes as good as it looks; the sesame forming a tasty crust around the seared tuna with a little added kick from the horseradish. Mrs. M is mightily impressed. 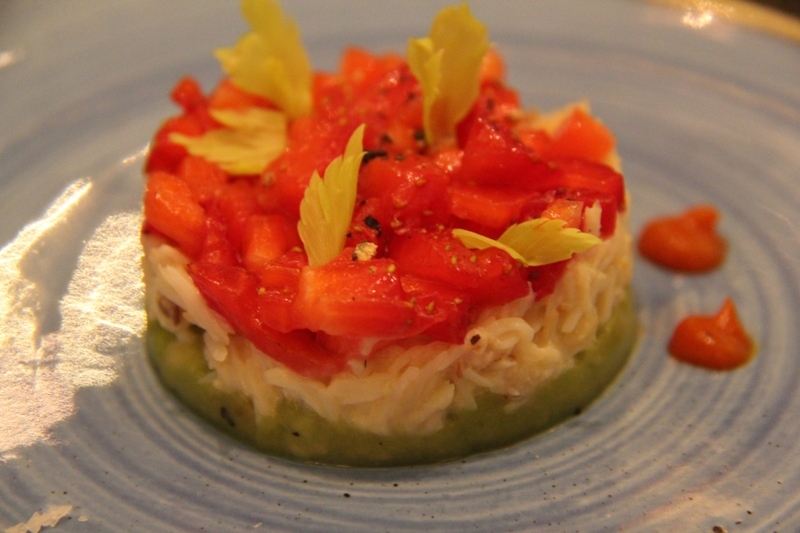 An amuse bouche materialises; a mini me version of another starter actually, tian of crab with strawberry and avocado and bloody Mary ketchup. It was a starter we pondered on but reluctantly passed, so serendipity prevails and the universe is aligned once more. Northall is doing brisk business for a Thursday night; clearly the lure of Whitehall as a dining destination is fast gathering momentum. Our choice of mains is challenging. There is fish and seafood on offer from wild sea bass or roasted salmon to grilled native lobster or a particularly interesting maple glazed Goosnargh Duck leg, with poached rhubarb and horseradish jus (£29). 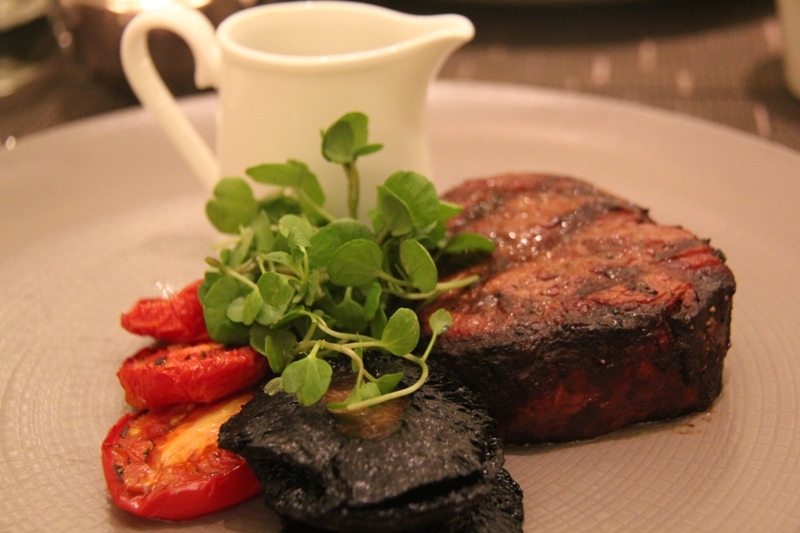 Personally, I can’t resist a Josper grill opportunity, so I order the 250g 28 day dry-aged Angus fillet with air-dried tomatoes, field mushrooms and a wild mushroom sauce (£38) with a side of sautéed spinach (£5) and triple cooked chips (£5). 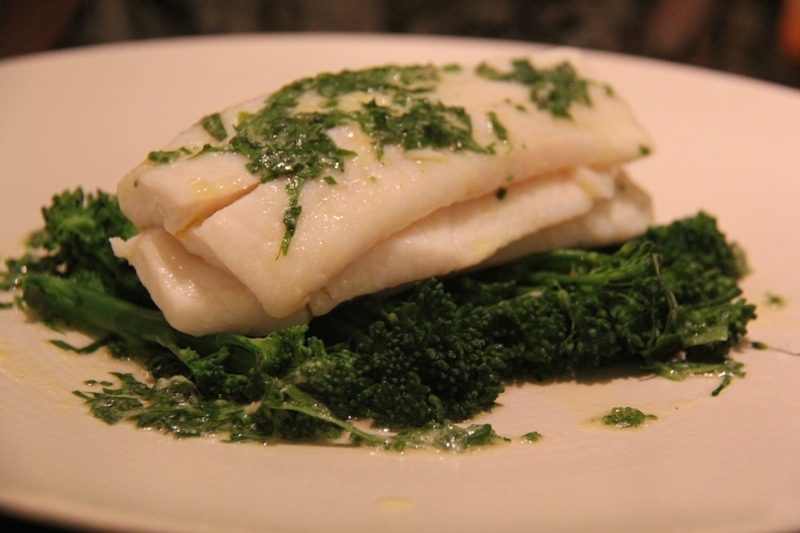 Mrs. M keeps with the fish theme and chooses Cornish steamed lemon sole and broccoli with smoked garlic and parsley butter (£27). “This is” murmurs Mrs. M between bites of lemon sole, “divine.” Equally, my Josper inspired steak is beyond perfect, a rare accomplishment it has to be said. All too often aged steaks are not given nearly enough respect, so hats off to Mr. Simpson for that one. Desserts are up next and at £11 a pretty steep price to pay particularly if you are just having an ice cream and sorbet selection – even if it is homemade. 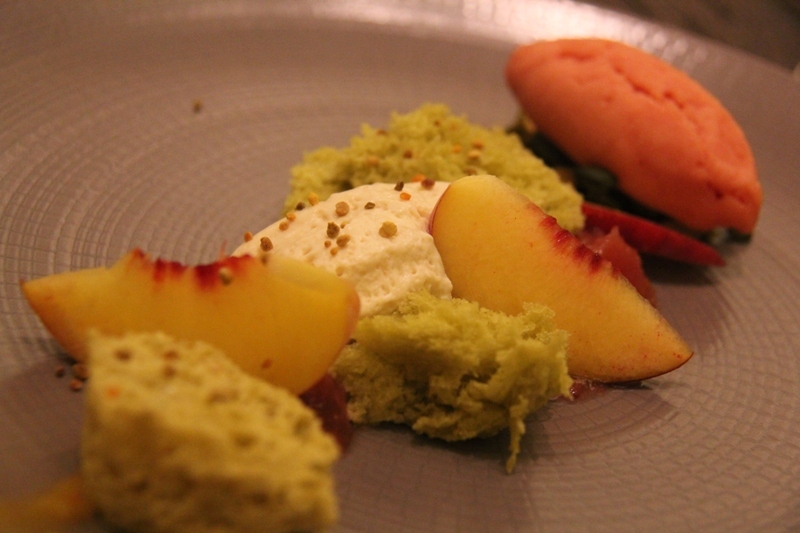 My Dorset heather ling honey mousse with peach compote, pistachio sponge and peach sorbet on the other hand, was more than a little spectacular. It was also good to see Chef Ewan take note of Mrs. M’s diabetic needs and conjures up a special strawberry creation for her without any fuss. 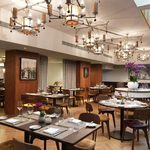 Northall Restaurant is a triumphant celebration of British cuisine and deserves its status as the Corinthian London’s flagship restaurant. It’s no wonder it has lit up this once gloomy part of London and with Ewan Simpson now at the helm, it will be interesting to see how it develops further. Exciting times ahead I fancy. 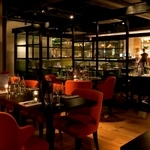 Northall offers a pre and post theatre menu between 5.30pm -7pm and 9.30pm -11pm. 2 course menu £24, three course menu £28.